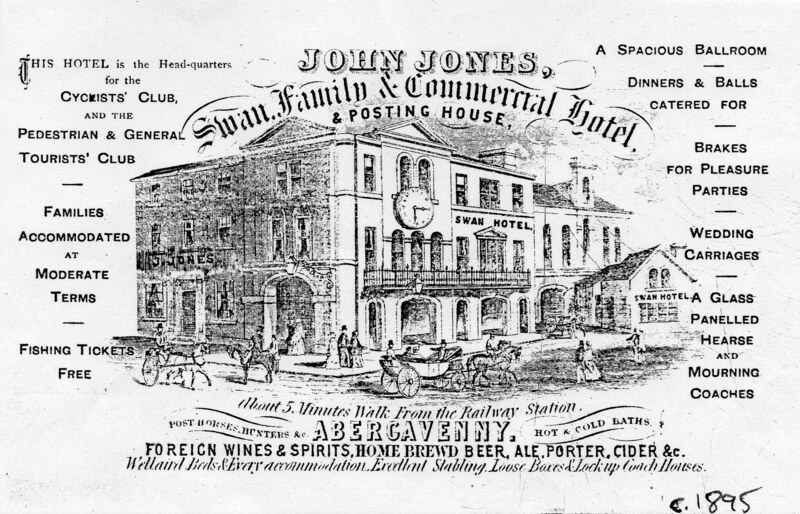 There is a picture of this Hotel on an advertisement with the Museum copy c.1886, which shows the large, now demolished ballroom on the left. The whole of the ground floor in the pedimented portion (minus the porch) seems to be an open arcade, with a little balcony along the first floor windows. 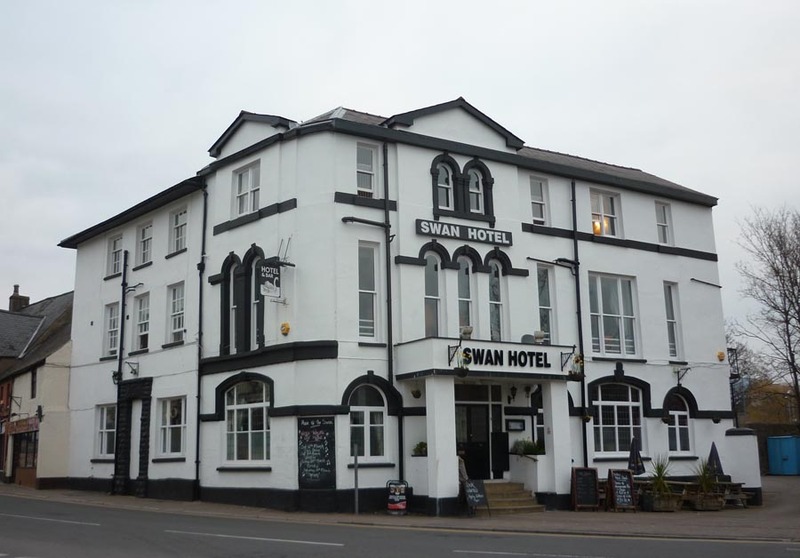 For additional images of the Swan Hotel click * here *. “A large mid-Victorian classical building facing south with an early C19 domestic building attached to side elevation in Cross Street. The earlier part appears to date from c1830=40 while the Victorian extension is probably 1865-70; the inn is shown first on the 1834 map. 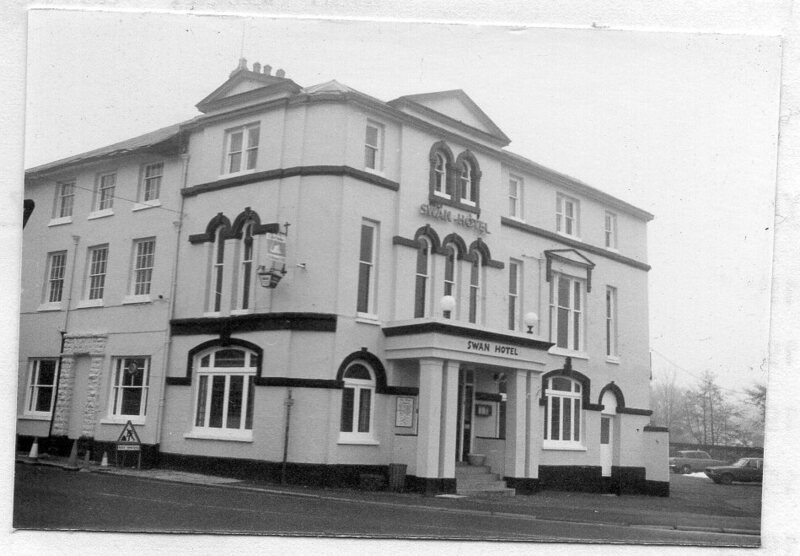 Its late C19 appearance was more elaborate than today with an open loggia on the ground floor, a full width iron balcony and a large ballroom to the right. The ballroom was destroyed by fire in the C20 and its remains demolished. The rest of the building may then have been remodelled, with the loggia filled in, the porch added, the balcony removed and the roofline simplified with the pediments rebuilt and all the chimneys taken down. Exteriior wholly rendered and painted with natural slate roofs. In two sections with a single depth main entrance range and a double depth rear range at right angles which pre-dates it. Main three storey five bay front with rounded corner flanked by pedimented frontispieces to each direction on the left. The two pedimented sections are set slightly forward to the main facade and have round arched windows and architraves and keyblocks grouped in twos and threes to advanced bays. The ground floor has a continuous band with arches over the windows. This was the open loggia and the windows are mid C20 infill, also the very basic porch on bay2 . The first floor has single slight windows in bays 1,3 and 5, three light in bay 2 and a tripartite sash in bay 4. All these are 1 over 1 pane sashes. The second floor has a cillband and single windows except for a paired one in bays 2 and 4. Deep eaves with altered pediments, hipped roofs and no chimneys. The left return is one bay with paired windows on the upper floors. Three central entrance elevation to attached building on Cross Street. Rusticated doorway, now blocked flanked by 3-light plate glass sashes (also a C20 alteration). The first floor has 8 over 8 pane sashes with narrow glazing bars, 3 oer 6 pane to the upper floor. Deep eaves, hipped roof, no stacks. Tall narrow stair window on north elevation. Rear elvations are both plain and altered.